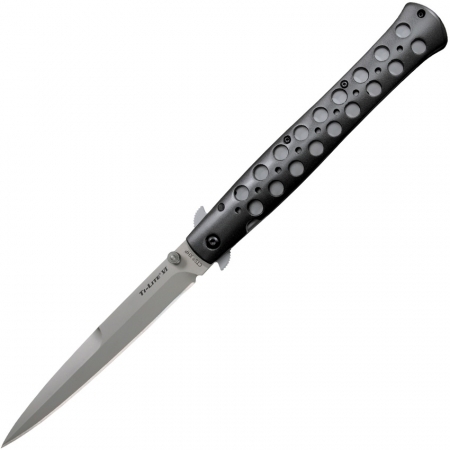 Cold Steel's Ti-Lite folding knives evoke the sleek speed and rebellious lines of the classic 1950's switchblade. They feature sharp and strong CPM-S35VN stainless steel blades and CNC milled 7075 Aluminum handles which are finished with a protective EDP (Electric Discharge Plating) coating. The Ti-Lites are equipped with Cold Steel's patent pending, stainless steel leaf spring locks (proven, in their tests, to hold upwards of 145 lbs). For ease of carry, the Ti-Lites come equipped with a small, but unobtrusive steel pocket clip, and can be opened rapidly by using the thumb studs or by snagging a quillon on the edge of your pocket as you draw your knife out. Cold Steel is grateful to custom knife maker, Phil Boguszewski, for his design influence and help in the creation of the Ti-Lites.